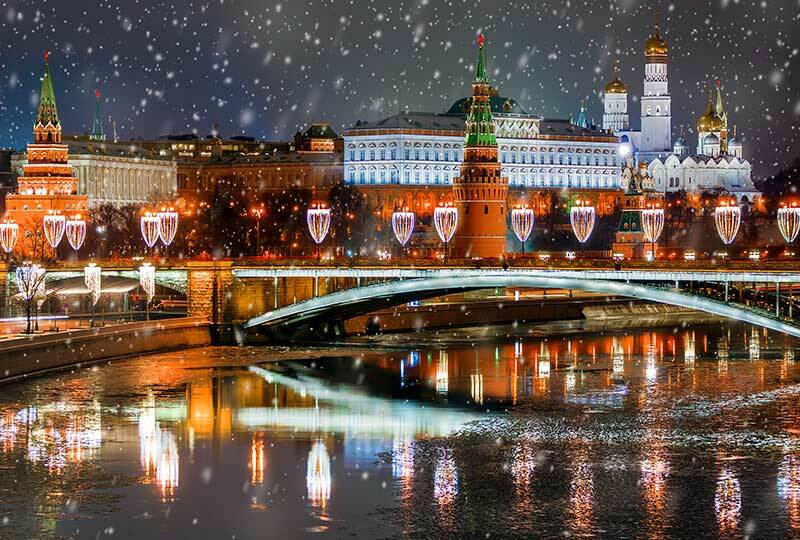 Be enthralled by the bracing wintertime ambience of Moscow and St Petersburg in a captivating display of Russia’s centuries-old traditions of art, opera and ballet. Discover Moscow, where the serenity of Russian Orthodox monasteries is met with the dynamism of one of Europe’s major capitals. 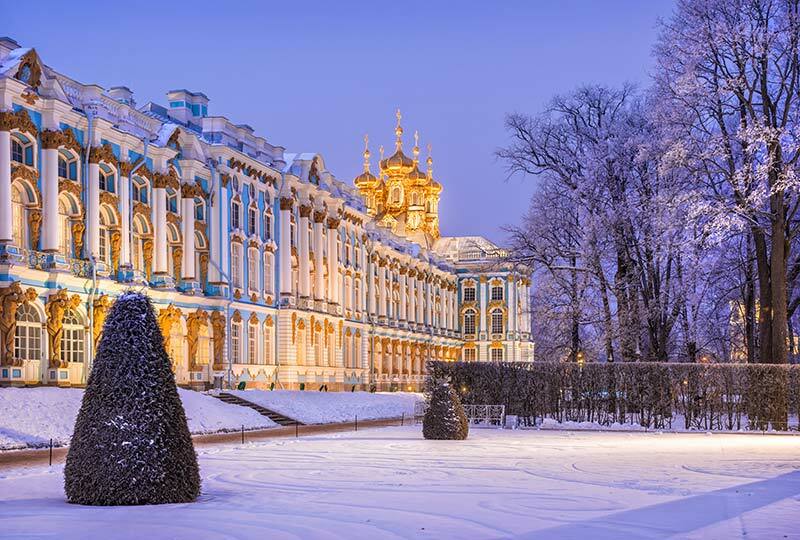 Wander through Russia’s imperial capital of St Petersburg, bejewelled with the palaces of Grand Dukes and Empresses – all of it without the summer crowds. By day, revel in the jewels of Russian art and architecture. By night, immerse yourself in the sumptuous world of opera, ballet and concerts at legendary venues such as the Bolshoi and Mariinsky theatres. Suggested departure from Australia and New Zealand on Emirates Airways flights (via Dubai). Overnight in flight. Mid-afternoon arrival in Moscow and transfer to your hotel. This evening, join Alan and fellow travellers for a welcome briefing and dinner. Following a talk by Alan, enjoy a morning tour of Moscow. 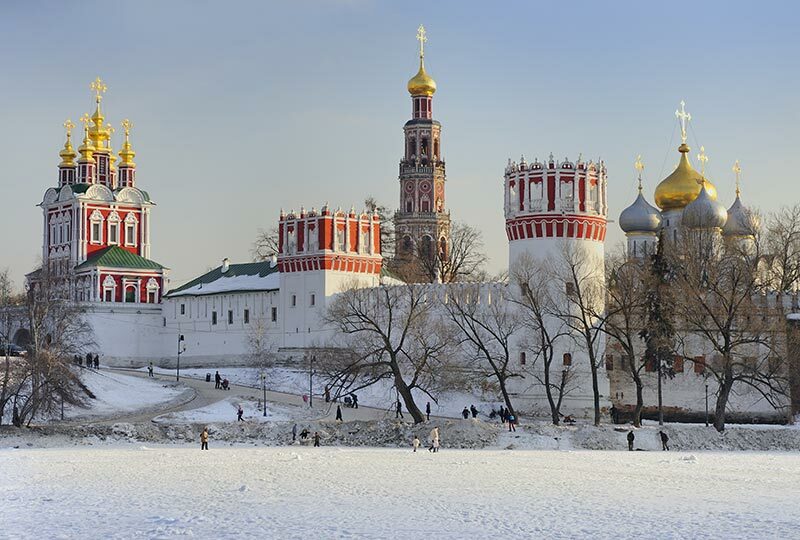 Visit the tranquil enclosure of the Novodevichy Convent and the nearby Novodevichy Cemetery where many famous Russian political and cultural figures are buried (including Russia’s first president, Boris Yeltsin), and enjoy a panoramic view of Moscow from Sparrow Hills. In the afternoon, take a ride on Moscow’s iconic and efficient metro system. The metro stations themselves, Stalin’s so-called ‘Palaces of the People’, are surprising gems of art, architecture and design – furnished with paintings, sculptures, and some even with chandeliers! Begin with a visit to a Russian Orthodox Church, followed by a guided tour of the Old Tretyakov Gallery, a comprehensive collection devoted to the history of Russian art, ranging from precious Mediæval icons to the Russian School of the late 19th century. After the tour, enjoy a private choral performance in the church of St Nicholas the Wonderworker. After free time for lunch at the Museum Café, continue your journey through the history of Russian art with a visit to the New Tretyakov Gallery, whose collection of 20th and 21st century art and sculpture spans abstract art, modernism, socialist realism and contemporary art. 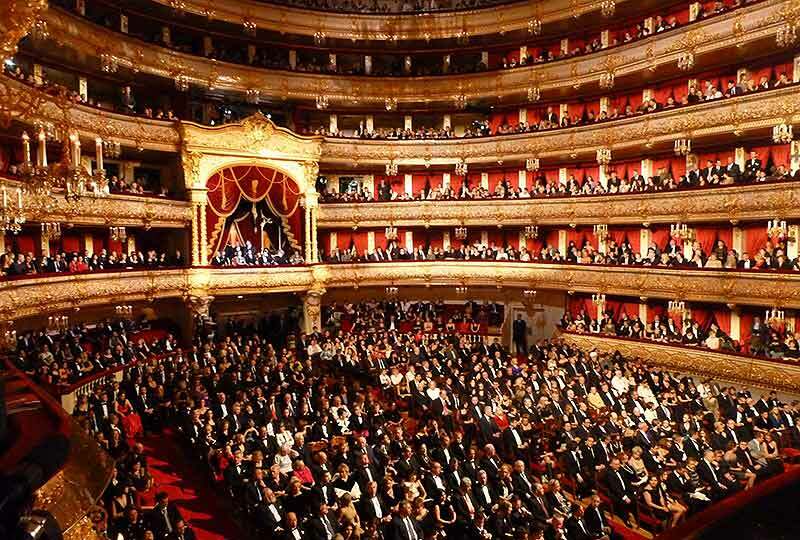 This evening’s performance (opera, ballet or a concert) will be at one of Moscow’s famous theatres – the Bolshoi Ballet, Novaya Opera, or the Stanislavsky & Nemirovich-Danchenko Theatre (performance details announced 3-4 months prior to travel). Following a talk by Alan, join a walking tour of Red Square, surrounded on four sides by the Kremlin, St Basil’s Cathedral, GUM Department Store and the State History Museum. Finish with a visit to the State History Museum, which houses a fascinating collection covering the whole Russian Empire from the time of the Stone Age. After lunch in a local restaurant, enjoy some time at leisure in the centre of Moscow. 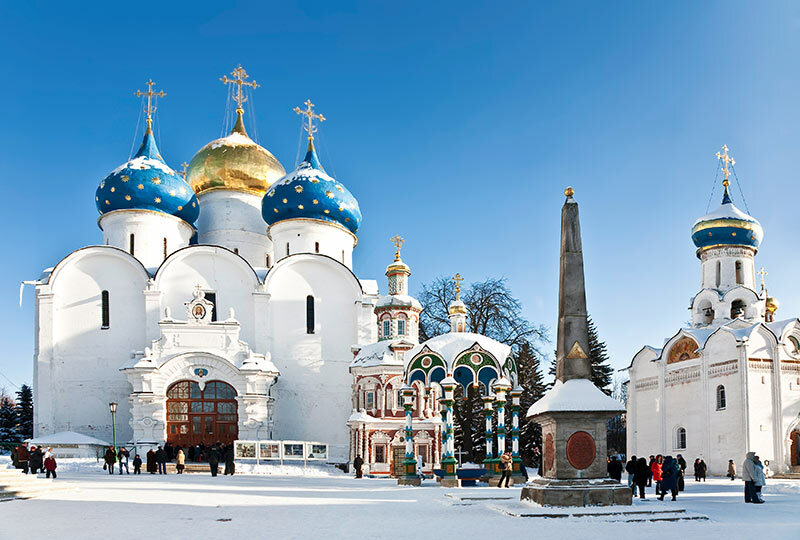 Take a day trip to the hauntingly beautiful Trinity Lavra in Sergiev Posad, a UNESCO World Heritage-listed monastery outside Moscow whose beautiful, chocolate-box churches are still home to over 300 monks – one of whom will be your guide for the day. Walking through the entry gate, gaze at murals depicting the life of the monastery’s 14th Century founder, St Sergius of Radonezh, whose peaceable demeanour even managed to tame the bears and wolves in the forest around his remote cottage. Enjoy lunch in the refectory of the monastery, and see the church under which lies the tomb of Tsar Boris Godunov, the last tsar before Russia was beset by the Time of Troubles in the early 1600s. Visit the studio of an icon-painter, and wander from one beautiful church to the next in this cloister of calm away from the capital. Spend this morning at the Pushkin Museum of Fine Arts, with an impressive collection of Western Art, particularly its substantial holdings of luminous Impressionist and Post-Impressionist paintings. After lunch, visit the impressive Cathedral of Christ the Saviour, the largest Orthodox cathedral in Russia and venue for the world premiere of the 1812 Overture composed by Tchaikovsky. Demolished on the order of Stalin, the site has a colourful history, including the use of the crater as a swimming pool on the banks of the Moskova River. It was rebuilt in its original design between 1995 and 2000 from money raised almost entirely from donations by the public. This morning visit the famous Kremlin with its many treasures including the sumptuous interior of the Cathedral of the Assumption, the more intimate Cathedral of the Annunciation and the Bell Tower of Ivan the Great. Finish with a visit to the Armoury Museum with its collection of Fabergé eggs and an astonishing array of glittering jewels, robes, thrones and carriages – a telling reminder of the pre-revolutionary opulence of the Romanov Dynasty. Check out and transfer to the train station for departure on the high-speed ‘Sapsan’ to St Petersburg (travel time 4 hours). On arrival in St Petersburg, transfer to your hotel. Tonight, join Alan for a talk on the history of St Petersburg followed by dinner. Enjoy a morning orientation tour of this magnificent city, first planned by Peter the Great and later embellished by his imperial successors to become one of the truly great European capitals. Visit the lavishly decorated Yusupov Palace, once the primary residence in St. Petersburg of the immensely wealthy Yusupov family. The palace was the site of Rasputin’s (eventually successful) murder in 1916. After lunch, enjoy a guided visit of the main branch of the State Hermitage Museum housed in the Winter Palace, the former principal residence of the Romanov Tsars. At the conclusion of the tour there will be free time for those wishing to remain in the museum to witness Catherine the Great’s elaborate Peacock Clock, which chimes only on Wednesday evenings. After a morning at leisure, visit St Isaac’s Cathedral, the largest Russian Orthodox cathedral in the city. 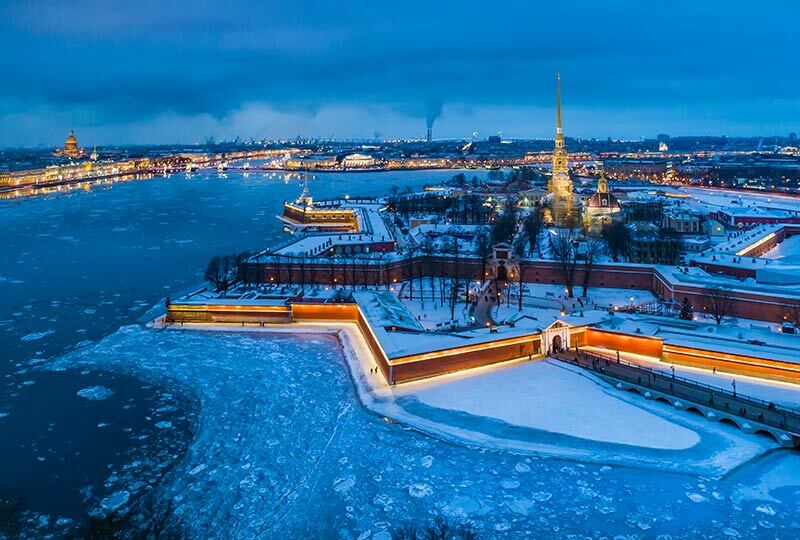 Enjoy a tour of the Peter and Paul Fortress, built by Peter the Great in 1703 to defend Russia from Swedish attack. 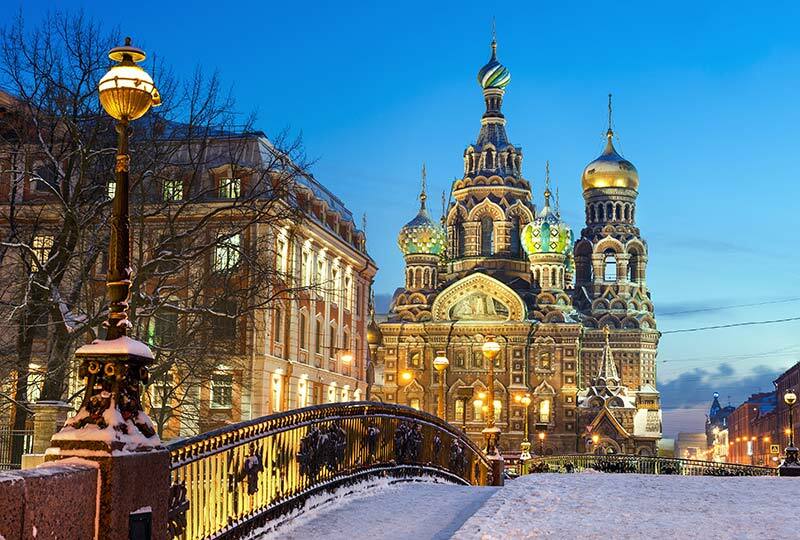 Visit the impressive Peter and Paul Cathedral, the burial place of all the Russian Emperors and Empresses from Peter the Great to Nicholas II. Continue to the Chaliapin Apartment Museum, dedicated to the phenomenal self-taught singer Fyodor Chaliapin, who rose from peasant origins to become one of the most brilliant, powerful and charismatic bass singers of the 20th century. This evening, attend a performance at the Mariinsky Theatre complex, comprising the historic theatre (1860), a modern concert hall (2006) and the Mariinsky II theatre, opened in 2013 (performance details announced 2-3 months prior to travel). This morning, enjoy a talk by Alan followed by a tour of the second wing of the State Hermitage Museum, located in the former Imperial General Staff Building, which houses the great collection of French and European Impressionist and post-Impressionist Masterpieces. Continue to the Russian Museum, housed in the Mikhailovsky Palace, built between 1819 and 1825 for Grand Duke Mikhail, the brother of Emperors Alexander I and Nicholas I. 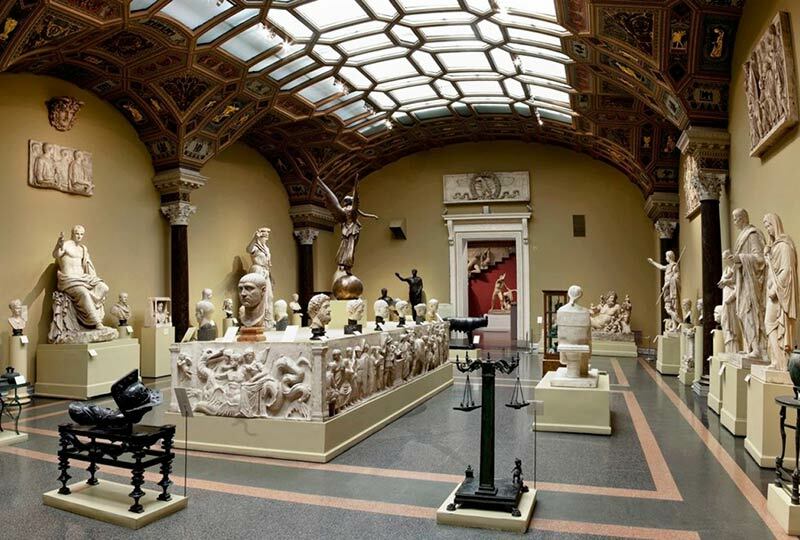 Established in 1895 under the decree of the Emperor Nicholas II and opened in 1898, the Russian Museum is today the world’s largest collection of Russian fine arts from the 10th to the 20th centuries. It performs much of the restoration work of classic Russian art, and is one of the country’s major cultural, educational and research centres. This morning, visit the Pavlosk Palace. Built in the Neoclassical style, on the order of Catherine the Great for her son Grand Duke Paul, the palace was built to celebrate the birth of her grandson Alexander I who would later become Emperor or Russia. Enjoy a guided tour of the palace, followed by a traditional Russian Troika ride through the snow. Lunch will be in a local restaurant close to the Palace. This evening, attend a concert at the St Petersburg Philharmonia, home of the St Petersburg Philharmonic and Symphony orchestras (performance details announced 2-3 months prior to travel). Drive out of St Petersburg to the town of Pushkin, formerly known as ‘Tsar’s Village’ (Tsarskoye Selo), renowned for its remarkable ensemble of palaces and parks. It is particularly famous for its impressive Baroque Catherine Palace, where Empress Catherine the Great lived and died. Enjoy a special lunch at a traditional Russian restaurant in the countryside. In the afternoon, return to St Petersburg. Pay a morning visit to the Fabergé Museum at the Shuvalov Palace, one of the newest museums in St. Petersburg. The museum houses the world’s largest collection of Fabergé eggs along with a galaxy of other items made by Gustave and his son Peter Carl Fabergé, as well as their contemporaries. Continue to the Church of Our Saviour on the Spilled Blood (Resurrection of Christ Church), erected between 1883 and 1907 on the site where Emperor Alexander II was assassinated in 1881. Built in the flamboyant Russian Revival style, both the interior and exterior of the church are richly decorated with colourful mosaics, designed and created by the most prominent Russian artists of the day. Lunch will be in a local restaurant on Nevsky Prospekt, the ‘Champs-Elysees’of St Petersburg, followed by a visit to the Alexander Nevsky Lavra Cemetery. The cemetery is the final resting place of many notable Russian composers, authors and actors. This evening enjoy a special farewell dinner with Alan and fellow travellers. 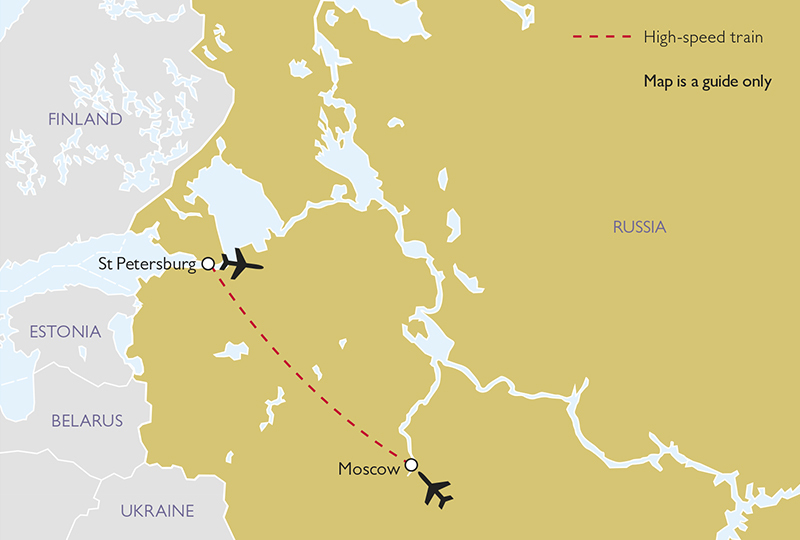 Tour arrangements conclude with a transfer to St Petersburg Airport for suggested departure on Emirates Airways flights (via Dubai). Renaissance Tours can assist you with your flights and other travel arrangements, including any extra nights’ accommodation, either before or after the tour. Australian and New Zealand passport holders require a visa for Russia. The visa will be obtained by Renaissance Tours and is included in the tour price. Items of a personal nature, including telephone, laundry, room service etc.